December 2014 n Performance & Hotrod Business n 57 gauges, and all interior lights, all exterior marker lights and signals are upgraded with plug-in replacement-style LEDs. The courtesy lights are LEDs. Even the lamps to light the backside of the radio and heater controls—every single lamp is going to be an LED." Most of the lights look stock until they are turned on—then the additional bright- ness of the LEDs is readily apparent. (And Mustangs, of course, didn't come with sequential taillights.) The one exception involves the '69's quad headlights, where each of the obviously more modern lenses is divided vertically by a thin strip of bright trim. "It's a styling thing," says Lippke, "like the tri-bar headlights that were popular in the '90s, only more like the modern luxury cars that come with LEDs." Also, Lippke notes, LED lamps can appear slightly yellow when they are off, "and the chrome bar disguises that." "Normally we look for the best appear- ance when the lights are off," says Tim Allen, manager of Miranda Built Inc. in Palm City, Florida. "It's all about appear- ance. Whether you have a $10,000 hot rod or a $500,000 work of art, newer lighting makes everything look better. So we gen- erally head into the LED family, especially for older cars where voltage and amperage limits play a big part." Allen favors lamps and components from Speaker Engineered Lighting Systems and Truck-Lite. "They look really nice and produce amazing lighting." 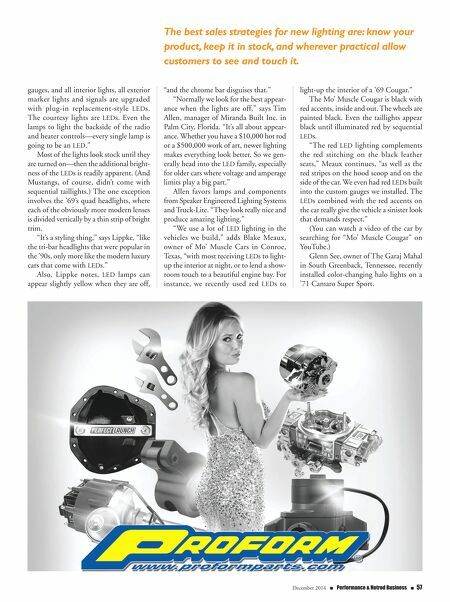 "We use a lot of LED lighting in the vehicles we build," adds Blake Meaux, owner of Mo' Muscle Cars in Conroe, Texas, "with most receiving LEDs to light- up the interior at night, or to lend a show- room touch to a beautiful engine bay. 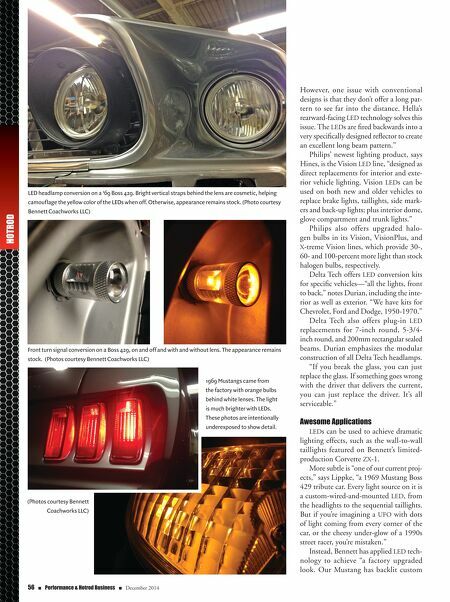 For instance, we recently used red LEDs to light-up the interior of a '69 Cougar." The Mo' Muscle Cougar is black with red accents, inside and out. The wheels are painted black. Even the taillights appear black until illuminated red by sequential LEDs. "The red LED lighting complements the red stitching on the black leather seats," Meaux continues, "as well as the red stripes on the hood scoop and on the side of the car. We even had red LEDs built into the custom gauges we installed. The LEDs combined with the red accents on the car really give the vehicle a sinister look that demands respect." (You can watch a video of the car by searching for "Mo' Muscle Cougar" on YouTube.) Glenn See, owner of The Garaj Mahal in South Greenback, Tennessee, recently installed color-changing halo lights on a '71 Camaro Super Sport. The best sales strategies for new lighting are: know your product, keep it in stock, and wherever practical allow customers to see and touch it.